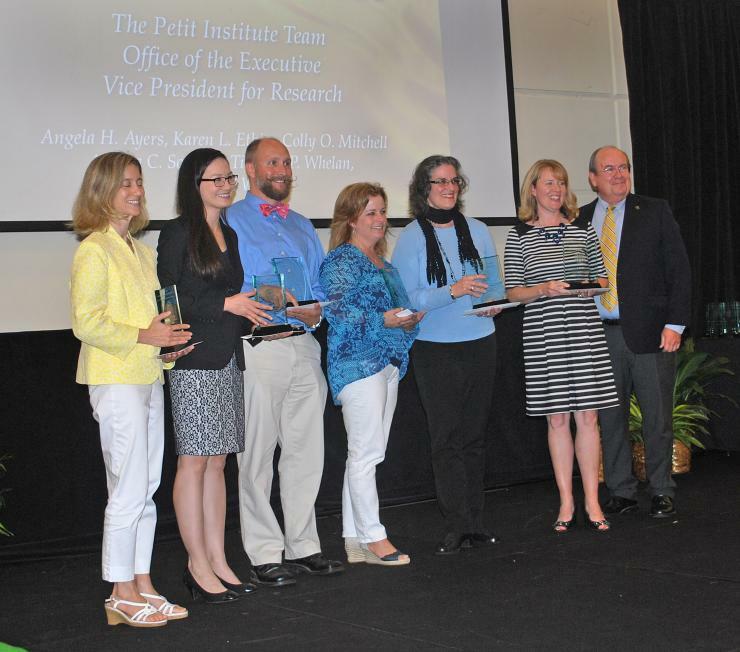 The Petit Institute for Bioengineering and Bioscience played a leading role when the Georgia Institute of Technology’s best and brightest gathered for the annual Faculty and Staff Honors Luncheon (Friday, April 21) in the Student Center Ballroom. More than a dozen trophies and plaques went to Petit Institute faculty and staffers, including one that recognizes the founders of Project ENGAGES, the ambitious and growing education and work program built in partnership with minority-serving high schools in the Atlanta Public School system. Petit Institute researcher Flavio Fenton, an associate professor in the School of Physics, led the haul with two honors: the Geoffrey G. Eichholz Faculty Teaching Award and an Outstanding Undergraduate Research Mentor Award. Founding director Bob Nerem and researcher Manu Platt (associate professor in the Wallace H. Coulter Department of Biomedical Engineering), who launched the program in June 2013, shared the Faculty Award for Academic Outreach, which recognizes individuals who use their academic expertise to advance K-12 education. Meanwhile, Pamela Bhatti (associate professor in the School of Electrical and Computer Engineering) won the Class of 1934 Outstanding Interdisciplinary Activities Award, which comes with a $7,500 prize, and Younan Xia (professor in the Coulter Department of Biomedical Engineering) won the Outstanding Faculty Research Author Award, which includes a $7,500 prize and $2,500 research grant. Raquel Lieberman, associate professor in the School of Chemistry and Biochemistry, won a Best Faculty Paper Award (and the $2,500 that goes with it) and Omer Inan, assistant professor in the School of Electrical and Computer Engineering, won a Young Faculty Award. Susan Thomas (assistant professor in the Woodruff School of Mechanical Engineering) received the Junior Faculty Teaching Excellence Award. Lisa Redding won the Outstanding Graduate Academic Advising Award. 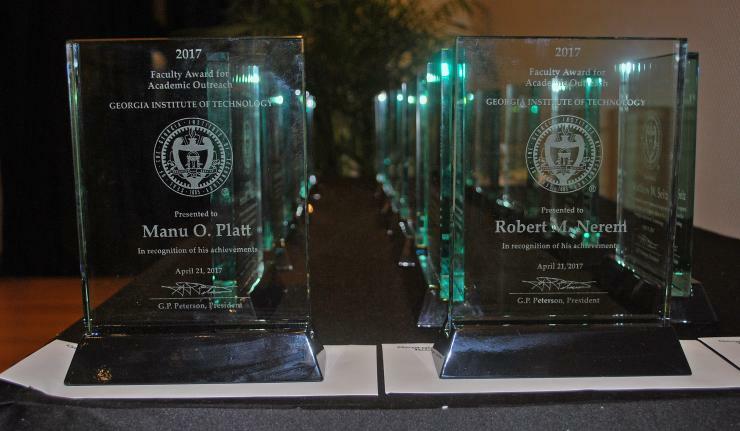 And a cadre of staffers will be honored with the Administrative Excellence Award for their support of Georgia Tech’s proposal to the National Science Foundation (NSF) in developing an Engineering Research Center (ERC) for Cell Manufacturing Technologies (CMaT). “This team is simply the best staff team I have ever worked with or have seen in my academic career at the University of Texas at Austin and at Georgia Tech,” notes Petit Institute researcher Krishnendu Roy in his nomination for the Administrative Excellence Award, which calls out Petit Institute staffers Angela Ayers, Karen Ethier, Colly Mitchell, Andrea Soyland, Tim Whelan, and Michelle Wong. Nerem and Platt continue to serve as co-chairs of Project ENGAGES (for Engaging New Generations at Georgia Tech through Engineering and Science), in which top high school juniors and seniors work in Petit Institute labs, learning advanced research skills. So far, 42 high school students have successfully completed the program, with nearly all of them advancing to some of the nation’s top universities (including Georgia Tech). Currently, there are 24 high school juniors and seniors in the program, from six area schools: Coretta Scott King Young Women's Leadership Academy, B.E.S.T Academy, KIPP Atlanta Collegiate, Benjamin E. Mays High School, Charles R. Drew Charter High School, and South Atlanta High School. The Junior Faculty Teaching Excellence Award, which recognizes teaching excellence, educational innovation, impact on student lives, and research/teaching connections, goes to tenure-track faculty who haven’t received tenure yet. That would be Thomas, whose lab studies the role of fluid transport phenomena in regulating the dynamics and kinetics of cellular and molecular transport processes. The goal, basically, is to design better drug delivery strategies in fighting cancer, integrating cellular engineering, biochemistry, biomaterials, and immunology fundamentals. Thomas, who was awarded Georgia Tech’s first grant from the Susan G. Komen foundation, supporting her work in breast cancer immunotherapy, was honored in 2013 with the Rita Schaffer Young Investigator Award from the Biomedical Engineering Society. Bhatti’s research interests include biomedical sensors and subsystems (including bioMEMS), neural prostheses (cochlear and vestibular), and vestibular rehabilitation. Fenton’s work is focused on excitable media, complex systems, and pattern formation, using a combined approach of theory, experiments, and computer simulations. Lieberman, whose lab is interested in the molecular details of how cells survive by recognizing and responding to intracellular signaling, serves as faculty director of the Petit Undergraduate Research Scholars. Inan may be the only NCAA All-American in the group. The former discus thrower at Stanford University now devotes his time to designing medical devices and systems, particularly the development of technologies for monitoring diseases at home. The Outstanding Graduate Academic Advising Award is presented to a staff member who delivers outstanding performance in advising grad students, which Redding has done as the academic program coordinator for Bioinformatics and Quantitative Biosciences, two graduate degree programs administered through the Petit Institute. Redding’s supporters note her steady guidance through the dramatic and rapid growth of these programs. The Administrative Excellence Award winners performed like most valuable players during an NSF site visit last year. A decision on whether or not Georgia Tech actually gets the new ERC is pending. “ERC grants are very high profile awards and of tremendous strategic importance to Georgia Tech,” says Roy, professor in the Coulter Department and director of the Marcus Center for Cell-Therapy Characterization and Manufacturing (MC3M). The team led a massive logistical and marketing effort before and during the NSF visit, that included logo design and messaging, facilitating more than 60 meetings with key participants, coordinating with partner institutions, managing the budget, tracking expenses, and otherwise supporting the more than 130 attendees.